Membership in the North East Florida Bailliage of the Chaîne is by invitation by one of our current members. Prospective members must be invited to attend at least two events prior to being asked to complete an admission form which must be sponsored by two members. The timing of the invitation to complete an admission form is subject to any waiting list that may exist at the time. Once the admission form is completed and accepted and all induction fees and national and local dues are paid, the new member will be invited to all future events. 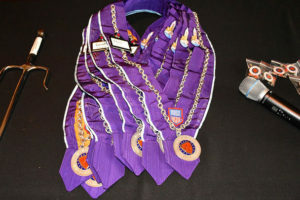 Formal induction, with the awarding of the official membership ribbon denoting the member’s rank, takes place one time per year. New members beginning their membership in September through December pay local and national dues that are good through the end of the following year. There is a one-time Chaîne induction fee of $275 and annual national dues are $225 and local dues are $75. The NE Florida Bailliage has monthly events that all members are invited to, two of which are formal black tie events – our Induction Dinner and our Holiday Dinner. Four of the monthly events are major dinners consisting of five course dinners with matching wines and an opening champagne reception with hors d’oeuvres. The remaining dinners are “Dine Arounds” which are less formal consisting of reception hors d’oeuvres, a three course dinner and each attendee bringing a quality bottle of wine to share. The major dinners range between $100 – $175 per person and the Dine Arounds range between $65 – $75 per person plus the wine each person contributes. In the remaining three months of the year we have dinners by our wine and crafted beverage organization known as Société Mondiale du Vin (Mondiale). Mondiale dinners focus on specific varietals, wine regions, wineries or crafted beverages and are primarily educational events for our members. There is a one-time Mondiale induction fee of $60 and annual national dues are $35 and local dues are $25. Dinner prices ranging between $75 and $125 per person.